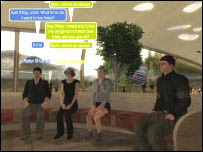 Sony has announced plans for a multi-user environment, similar to Second Life, on the Playstation 3. Known as ‘Home’ the aim is to create a community led world whereby users can build and perhaps more importantly buy virtual objects. Virtual economies are increasingly attracting the eye’s of the big players and its unsurprising that Sony is taking a leap into Virtual Words. Sony’s Playstation 3 has attracted some negative press recently due to the high price tag and changes in hardware design for the European launch. The introduction of a virtual world on the PS3 is interesting but you cant help thinking that its not really about the users but more about extracting money from them once they are in the world. Perhaps its a cynical view and one made due to a lack of coffee so far this morning but we cant get excited about a virtual world on a console, especially from Sony. Maybe that shows just how much bad press Sony has had and how its affecting the views of people towards the £425 PS3.